Constant Pods of Porpoises taking hours to pass at Indian Creek in front of the Fontainbleau. Working then being fired at Mary Jane Shoes on Lincoln Road and Washington. Proving your manhood in the middle of the night by driving Miami to Naples via Tamiami Trail in one hour (the reward a Royal Castle Honey Bun the size of first base)…. The building of Julia Tuttle Causeway…. And the most amazing part, I ended up married to the beautiful girl that lived across the street from me on Sheridan Avenue….. Does anyone remember a little jazz club on Lincoln Road. They may have played movies there too. It was long before Van Dykes. p.s. thanks, Everyone, for the wonderful memories! What great memories. My father Lou Baida supplied all the Promotional products that where used by Woflie's, Pumpernicks Big Wheel & 100 0f hotel/motels in Miami & Miami beach. We moved from south beach to SW Miami in late 40's and then toMorton Towers until my parents past in 1969. i live in Ca. With my son's & Grandchildren. MISS THOSE OLD DAYS in Florida. Wow, just wow...my life in precis. Born at St Francis, grew up on the 79th St causeway. Hialeah High later, playing in the Symphony, Dade Co. Auditorium, University of Miami...and on to adulthood. Thanks, Richard, for the memories!! Richard, I tried to contact you regarding this but my e-mail bounced back from the address that I was given. I really appreciate your contribution and I'm sure many other readers do too. Thank you for allowing me to display it on my site. 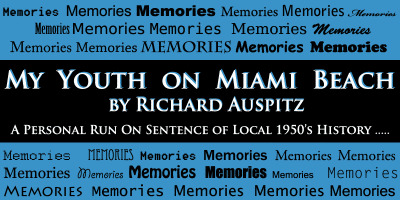 Richard Auspitz and Don Boyd, Great Collection Of Memories Of Miami Beach, Miami, Ft. Lauderdale, ect. I Enjoyed it Immencely !!!! Thanks, For Posting This. I Remember A Lot Of The Places , and Things, But Not All Of It . I Would Say That About 90 % Of This Posting, was Familiar to Me. Best Regards , to Both Of You !!!!!! Robbin.